Fresh from the devastation of the San Francisco 1989 earthquake comes Ring of Fire, an IMAX short focusing on the Pacific Rim through the rest of the world’s deadliest and most dangerous locales for volcanic activity. This globe trotting bit loves the wide angle lens, at times using it for some impressively scaled cityscapes, other times warping structures to make them look as if they’re moving involuntarily. Information here, presented by narrator Robert Foxworth, is droll and dry, lacking in educational value. It’s focused on visuals, which makes sense coming from the lens of IMAX. Sadly, 20 years hasn’t done any favors to the piece, the wonderfully dated wireframe computer generated imagery almost to the point of being at kitsch value now. It’s also a little awkward, the passage of time making the focus on Japan and how prepared they are for underground disturbances a little unsettling. That didn’t end as well as this feature hoped it would. Images of various rituals, from multiple tribes and traditional Japanese drums, at least offer a unique, well, something. Most of Ring of Fire pans over fiery, dusty mountains, at times gorgeous, other times as worn out as the dubbed dialogue. The sights are immense, losing only a fraction of their enormity at home, although even with the footage, you can find far more informative, up to date, and detailed works on the ring of fire elsewhere. It’s somewhat baffling how iffy IMAX features are in HD. It has nothing to do with age, and everything to with how they’re transferred. This one is a relative mess, suffering from the affliction of DNR, ringing, and aliasing. Problems are at times insurmountable, the natural actions of nature diluted due to the filtering and muddy qualities that simply don’t need to be here. The grain structure is all but wiped out, minimal as it is for 65 or 70 mm formats. The AVC encode doesn’t have to do much other than keep the images together during speedy fly-overs which it does. It’s not that hard when the fine detail has been given a clean wipe. Colors are pure and natural, certainly looking untouched. Some neon safety suits worn by scientists have a heavy glow, and the lava just carries that “wow” factor (as if it couldn’t). It’s so intense and bright, shooting out of cracks or flowing like a river. That is certainly the most impressive thing here. 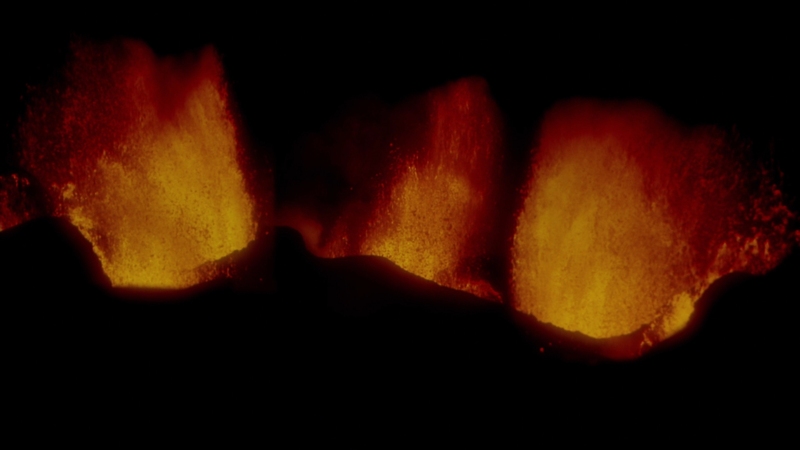 Black levels are exceptional, a portion of the lava footage taken in the dark, leaving only the glow of the heat. Everything else is a pitch perfect black, completely pure and never lacking depth. The source material is decent enough, carrying a couple of specks and a few stuck pixels during the CG bits. Ring of Fire begins rumbling from the moment it starts, a screen with nothing on it, yet the subwoofer begins an assault. It’s clean and pure bass, a sufficient, slightly artificial shaking effect to sell explosions and earthquakes as needed. Surrounds are a regular presence, city streets filled with stock ambiance, the baseball stadium especially fake with the familiar race track “First Call,” blaring over the crowd. Wrong sport guys. Erupting volcanoes reverb into the rears, and things on fire crackle into the rears. Dialogue, especially the narration, is a little static and coarse. Dubbing always sounds fake, although with an additional loss of fidelity, that doesn’t help. No extras aside from 13 trailers for other IMAX features. That means it’s a lot to ask $18+ at retail for a 38-minute short.